Seeing as we are developing a Merchant Navy class theme on this blog at the moment, I thought it a good time add a picture of what is arguably the closest we have at the moment of seeing an original, unrebuilt Merchant Navy class locomotive. 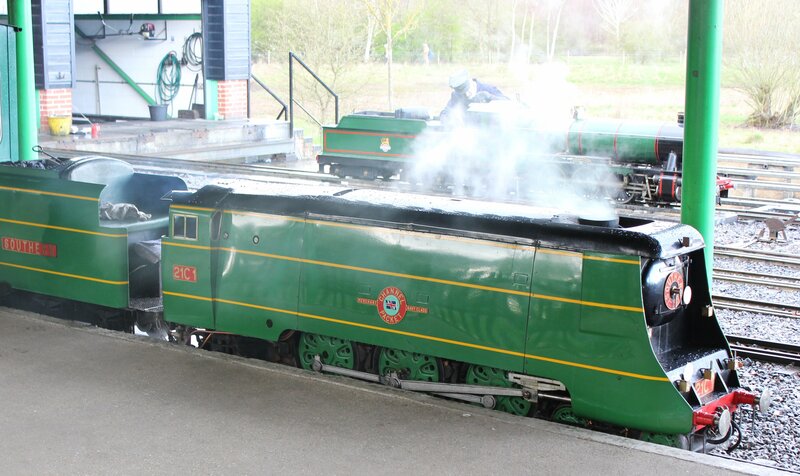 This miniature replica of prototype 21C1 Channel Packet can be found at Eastleigh’s Lakeside Steam Railway dual gauge 10¼”/7¼” line that runs from “Eastleigh Parkway” station to Monks Brook Halt. It has long been mooted that one of the eleven survivors of this class could be re-converted back to it’s original condition, an idea that attracts very much attention. Unlike the “light Pacific’s” all of the Merchant Navy class were rebuilt and therefore none are in as built Bulleid condition. On a practical level, rebuilding the Merchant Navy class made a lot of sense (although not in the context of the demise of steam) as it cured a lot of the type’s mechanical failings. It is fair to say that as built the Merchant Navy class were an enigma – possibly the ultimate in steam traction performance at the expense of reliability. Just as unpractical fast cars and supersonic aircraft capture the imagination, it’s no wonder that one of steam’s ultimate if unpractical performer is missed. Interestingly, although an accurate scale version, this replica does not use Bulleid’s chain gear for the inside valve gear, instead it uses American Southern Marshall type. Built at Jesse Moody’s workshop, this locomotive is an otherwise excellent replica and a regular performer around Eastleigh’s lakes, that’s well worth catching. 14/06/2015 in Region - Southern.